Easter in Malta seems far busier in the religious calendar than Christmas for its sheer organisation alone. We’ve street processions, pageants, tableaux, displays, bell ringing, band marches, statue carrying and passion plays. The mobilisation of manpower to deliver these religious spectacles is enormous. 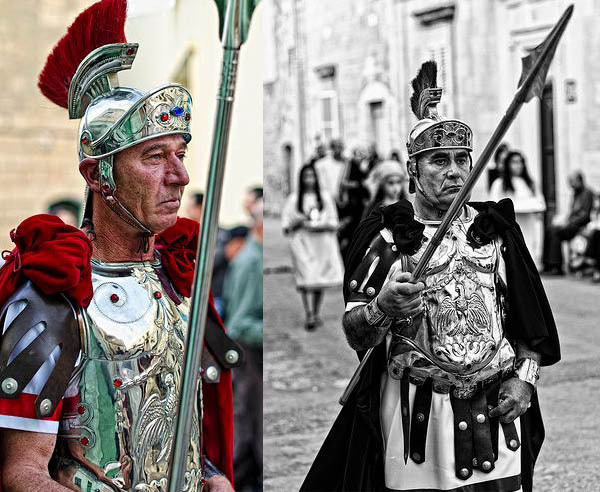 Roman soldiers, Good Friday Procession, Xaghra, Gozo. Photo: Mario George Vella. Officially, Easter week starts on Palm Sunday, 20th March, 2015 and runs to Easter Sunday a week later on 27th March. But anyone living in Malta knows that things hot up the week before; the Friday a week before Good Friday is called id-Duluri, or the feast of our Lady Of Sorrow, which sees crowds slowly and mournfully follow the statue of ‘Our Lady’ in solemn procession. Valletta has the most notable id-Duluri procession. The key days of Easter are otherwise the regular ones, but note that Malta doesn’t have a public holiday on Easter Monday. 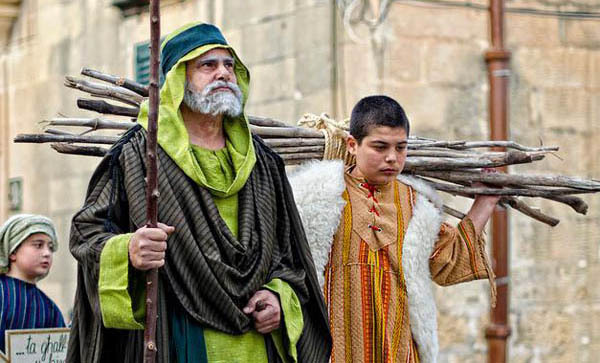 Malta’s Good Friday processions: What does the bearer feel? What does the onlooker think? Photo: Peter Grima. This day commemorates the Last Supper and is the start of the mourning. You’ll find lots of parishes create representations of the Last Supper and/or the entire Easter story in model form, rather like Christmas crib displays. It’s a tradition on this day for people to visit them as they do their tour round the islands of ‘Altars of Repose’; ideally in seven different churches or chapels. These Altars are elaborately dressed up for the occasion with white flowers – the Mdina Cathedral altar is particularly bedecked. Some parishes will stop their bells on Holy Thursday to replace the regular ringing with a Ċuqqlajta, a clattering wooden ‘gong’ which sounds like a giant football rattle. Zebbug and Siggiewi tend to do this, as do other more tradition-loving or rural parishes. Good Friday Procession, Rabat. Photo: Mario George Vella. Girgenti Torchlit Procession on Maundy Thursday – this special event starts off in Siggiewi village square at 8pm and leads on by torchlight out of the village up to Girgenti hill to the Laferla Cross. The last part of the route is a rough steep path along which you’ll find the Stations of the Cross depicted and often scout troops and youth groups enacting tableaux. You jostle in the half dark, miss your footing at times and find people surging downhill contraflow, with baby buggies and more! It certainly is an ‘event’! Good Friday is the official mourning day so no mass is held though people may go to church to kiss the cross at the time Christ died (3pm) and to say personal prayers. The day is bell-free and silent. But it is the big day of processions. And we mean big. Malta has some spectacular, lengthy and large processions involving casts of hundreds. Some have become main tourist attractions in recent years, with public address systems broadcasting a commentary in several languages. Zebbug in Malta is renowned for its extravagant procession. As is Xaghra in Gozo. And you’ll find more about the Għajnsielem Drama Group’s production here. Malta: Birgu (Vittoriosa), Bormla (Senglea), Ghaxaq, Luqa, Mosta, Naxxar, Paola, Qormi, Rabat, Senglea, Valletta, Żebbuġ (Città Rohan) and Żejtun. Gozo: Nadur, Ghajnsielem, Victoria (St. George Basilica and St Maria Cathedral), Nadur, Xewkija, Qala, Xaghra and Żebbuġ. This is a day in total contrast to all that has gone before in Holy Week. A day of celebration of the Risen Christ. The churches are open and special mass takes place – with bells resumed! It’s a day then for family as people flock home to their lavish lunches and, as in much of Christian Europe, the giving of chocolate eggs. Malta has its special Easter cakes – Figolli – which feature all Easter but are often taken as gifts on this day. 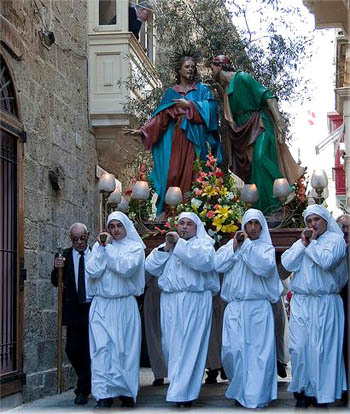 The most notable spectacle on Easter Sunday is the celebration of the Risen Christ (L-Irxoxt) in Birgu (Vittoriosa). This sees a group of men (hopefully fit and strong!) make a mad dash uphill bearing what looks like a very heavy statue of the Ascending Christ. It’s a popular event in Malta and draws the tourists too. But do stand well back when the statue rushes up hill to the Square as I saw someone lean forward to take a photo and get nasty surprise, and a near miss from the bearers’ pole. They’re fit guys and the uphill spurt is far speedier than you’d think possible under a tonne weight of statue! Photo: Good Friday procession penitents (middle photo) courtesy Peter Grima, KnowMalta. All other photos courtesy of Mario George Vella. The celebration in Birgu on Easter Sunday is quite something to behold alright! I think it’s mid-late morning at around a regular service time on most Sundays. I remember the Birgu ‘run’ with the Risen Lord takes place around 11am. So probably the same time in most parishes which organise one. Hi Elizabeth – Do you know what time the Easter Sunday procession is? Hi Elizabeth – Do you know what time the Easter Sunday procession starts? Most events start at 3pm on Good Friday. 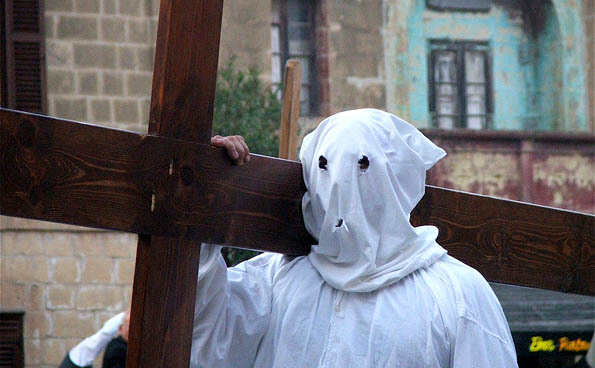 what time do the good friday and the easter sunday events start in Valletta?? ?